Aqua, Stabilizer, Rose Oil and rose extracts. Firms and tones the facial skin and makes your face feel fresh, smooth and hydrated. Works as a natural cleanser by cleansing away the dirt unveiling a fresh glowing skin. Processes natural antibacterial and antiseptic properties which helps in treating acne and skin infections. Can also be used as an addition to facial creams and face packs. It comes in a lovely Rose colour pack. We have to pierce a hole on the bottle tip. I am using this Rose water several times a day. After took bath I use this Rose water to tone up my face using cotton. I will keep it in fridge always. Then, whenever i wash my face i will use this after wash. When I finish Cook my face will become Oil factory. 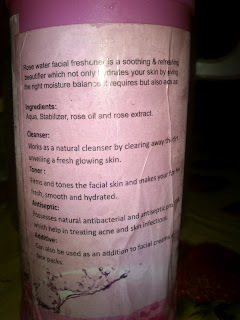 So, I will just wash my face and apply Rose water, My face will become so fresh. It soothes My sun burns when I came back from Sunny mid day. It has very mild rose fragrance make me feel divine, yeah. This Rose water helps me in refreshing my eyes. But, It has no part in acne controls. 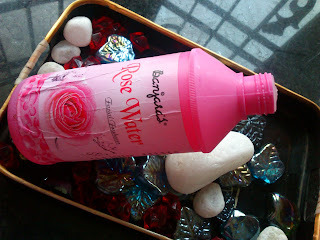 Totally I am fully surrendered to Banjara's Rose water. I bought this because of this simple ingredient list. This never cause any skin irritation on me. This comes cute rose colour sturdy pack. This Rose water has divine mild smell. Clear solution easy to spread on face by cotten. It never breaks me and never irritates my skin. Easy to use in multiple task. Never makes my face Oily. Not Travel friendly as it may spill around from the bottle. 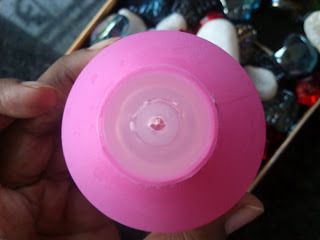 I will reccomend this for every women to refresh and tone up their face in a right way. It is a simple natural rose water for your skin care routine. You low in Hemoclobin...Supriya have Fig fruit daily morning and evening within one month you will improve your Hemoglobin...alos dates helps. Thats right Nandini, Dates helps a lot as they have high iron content.